Scene from the Neanderthal diorama at the American Museum of Natural History. Not shown: Male Neanderthal figure holding tool. The Neanderthal story is quickly becoming a favorite serial—who knows what new drama the day will bring! Once regarded as brutish and stupid, it was accepted that they could not compete technologically and socially with early modern human (EMH) populations and were eradicated as the latter spread throughout the globe. But in the last few years, the reputation of our Neaderthal cousins has changed. In fact, we've learned that they were surprisingly like us in many ways: they painted shells for jewelry, provided care for those in need, and had a sophisticated tool industry (see more here). Their diorama at the American Museum of Natural History shows them in a family unit. Their genome has revealed few conspicuous differences, instead demonstrating that Neanderthals may have in fact left a trace of themselves in our own genes. The Neanderthal story stimulates the imagination because for all the similarities and newly credited skills the fact remains that they disappeared completely (in geological terms), leaving the earth to Homo sapiens. And I think part of the reason we're so intrigued is that on one level we wonder as a species whether we could disappear in the same way—gone but for a few instances in the fossil record. The Discovery Channel has done an excellent job of presenting the disaster possibilities: an asteroid could strike, global warming could do us in, the sun will eventually die, and so on. All the scenarios present events with immense environmental impact that would threaten our ability to find sustenance and cripple our overall well-being. A recent paper in Current Anthropology proposes that Neanderthals fell victim to one such devastating environmental event—volcanic activity—and illustrates the ways the fallout from the event would have made their environment inhospitable. The skeleton called the "Ring Lady"
Neanderthals lived in Europe from about 400,000 to about 40,000 years ago. And they were used to adverse conditions: their environment was a very cold one, and may have included a severe ice age known as glacial period OIS 4. Like EMHs, they were accustomed to and could manage the climatic variables of the northern European landscape they frequented. For example, they clothed themselves against the elements. However, we know from Vesuvius that volcanic activity can present an insurmountable challenge. The charred remains of Pompeii are a testament to the speed and finality with which ash can cover the surrounding area. And ash is a troublesome thing: it spreads easily, carrying its effects far and wide. When the Eyjafjallajökull Volcano erupted earlier this year, NASA documented the spread of the ash over the Atlantic. Ash can have a cooling effect, causing crop failures and widespread famine. If it reaches the stratosphere (upper atmosphere), these effects can be prolonged as sulfur lingers in a reflective layer above the earth keeping much needed sunlight from the planet's surface (and eventually falling as acid rain as an added bonus). We offer the hypothesis that the Neanderthal demise occurred abruptly (on a geological timescale) at around 40,000 BP after the most powerful volcanic activity in western Eurasia during the period of Neanderthal evolutionary history. We further hypothesize that this catastrophe not only drastically destroyed the ecological niches of Neanderthal populations but also caused their mass physical depopulation in most of their habitation areas across Europe and the Near East. This loss of viable source populations may have significantly contributed to the eventual extinction of Neanderthals throughout their range (673). Using soil samples from Mezmaiskaya Cave, a well-preserved site of occupation for both Neanderthals and EMHs in the Northern Caucasus, Golovanova et. al. were able to trace periods of occupation in the area, noting significantly that activity dropped in correlation to volcanic soil layers. This information not only demonstrates when the site was being used, but also provides us with a foundation with which to understand the apparent transition from Neanderthal occupation to EMH occupation of the region. Geochemical analysis suggests that eruptions in the Elbrus volcanic province between 45,000 and 40,000 years ago are the most likely sources of the ash in later 2B-1 at Mezmaiskaya Cave ... The basaltic chemical composition of the ash in layer 1D is closer to that of volcanic rocks of Mt. Kazbek in the Central Caucasus. The explosive volcanoes of Mt. Kazbek in the Terek River upper valley are the most likely sources of the ash in layer 1D at Mezmaiskaya (660). The first volcanic eruption produced ash in the later MP [Middle Paleolithic] layer 2B-1 and essentially resulted in the deterioration of ecological conditions in the region ... The intensity of site use increased, however, during the accumulation of the upper MP layers 2A and 2 when the climate became cool and wet. Although the lithic industry changed slightly after the environmental crisis of layer 2B-1, it still remained typically MP Eastern Micoquian. Skeletal and mtDNA evidence indicates that Neanderthals produced both the earlier and the later MP industries at Mezmaiskaya (667). High altitude clouds of volcanic ash from this eruption had a significant effect on global climate. The resulting ash fall covered 14 x 10^6 km^2 of land and sea and the [ash] layer accumulated in the Eastern Mediterranean as far as Cyprus—more than 1,500 km from its source (670). The large and coeval volcanic eruptions had a sudden and devastating effect on the ecology and forced the fast and extreme climate deterioration (so-called volcanic winter, perhaps comparable to the effect of nuclear winter) of the Northern Hemisphere in the beginning of Heinrich Event 4. We guess that this catastrophe likely may have both drastically destroyed the ecological niches of Neanderthals, possibly resulted in the mass death of hominins and prey animals and the severe alterations of foraging zones, and caused Neanderthal depopulation from Central Europe to the Caucasus (679). The advantage that EMHs had in this case was location. 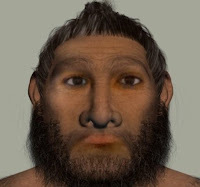 They initially occupied the southern parts of western Eurasia and Africa and were our of the impact zone for the eruptions so they were able to move in after the Neanderthal populations had been decimated and effectively out-compete the remaining groups possibly through any of the various contact models. Golovanova et. al. present these findings in an incredibly clear and accessible way, making our Neanderthal cousins ever more tangible. The information contained in this article also gives us a look at the ways we can predict the outcome of a similar catastrophe in our own time. And given the ways we are currently linked globally by trade and commerce, the effects of such an event would have far reaching consequences beyond simply a localized "dead zone." In many ways, the unfolding Neanderthal story reminds me of initial uproar over archaeological finds that placed Australopithecus afarensis in our evolutionary lineage—outrage which opened the door to forgeries like Piltdown Man, which showed us what we wanted to see in our heritage. We have constructed Neanderthal man in a way that give us a competitive edge. As we learn more about this group, we may find enough similarities to truly understand that their disappearance was not the result of some deficiency, but a result of circumstance. Special thanks to @NotanEster for suggesting the article and to @Wolowic for sharing the article.